For those who have grown from London roots and those who have planted theirs here, City Life Festival will be celebrating London's unique identity with no less than fifteen cultural events throughout October across three London locations. The festival will explore the relationship between urban spaces, communities and identities, and will champion London as a place of inclusivity and diversity. This week, expect a discussion between Lily Cole and Second Home founder Rohan Silva on London's ever-changing face and the importance of belonging, as well as screenings of documentaries exploring London culture from the 1960s til now. Find more information about City Life Festival and explore its full listings here. 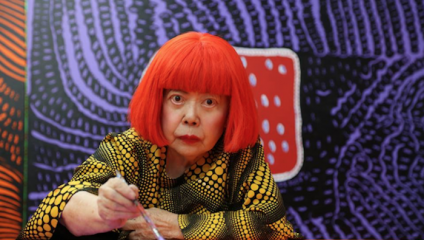 The forthcoming exhibition from 89-year-old Yayoi Kusama, The Moving Moment When I Went To The Universe is sure to excite many who are intrigued by the mysterious artist who influenced Warhol, and has voluntarily lived in a psychiatric unit for the last 41 years. Age certainly hasn't dimmed Kusama's ability to create incredible large-scale pieces accessible to both the pop-art generation and Generation Z alike. With works included from the iconic My Eternal Soul series and her ever-popular Infinity Mirror Room, the exhibition is expected to be so in demand that the tickets will be timed. It opens this week, but October is already sold out, so get a move on and book for November and December ASAP. Yayoi Kusama: The Moving Moment When I Went To The Universe will take place until 21 December at Victoria Miro, 16 Wharf Road, London N1 7RW. Beginning on Thursday, Wimbledon BookFest will see a rotating cast of writers come to leafy West London for a delightful range of talks and more. One in particular not to miss is an intimate talk and brunch with Adam Kay, best-selling author of ‘This is Going to Hurt’. If you're not sick of seeing his name on the book in literally everyone's hands on the tube for the past few months then head down to the Ivy Café to meet Adam and hear some of his favourite extracts from the book alongside discussing the future for his comedy novel – including details on how the book is set to be adapted into an eight-part BBC comedy drama. Wimbledon BookFest will take place 4-14 October at various locations. This week marks your last chance to see this major free exhibition in Westminster Hall, which charts the campaign for female suffrage and the representation of women in the House of Commons and House of Lords. Combining interactive features and historic exhibits, 'Voice & Vote' highlights the history of women in politics by recreating the physical spaces that women occupied in the Houses of Parliament. Voice & Vote will run until 6 October at Houses of Parliament, Westminster, London SW1A 0AA.